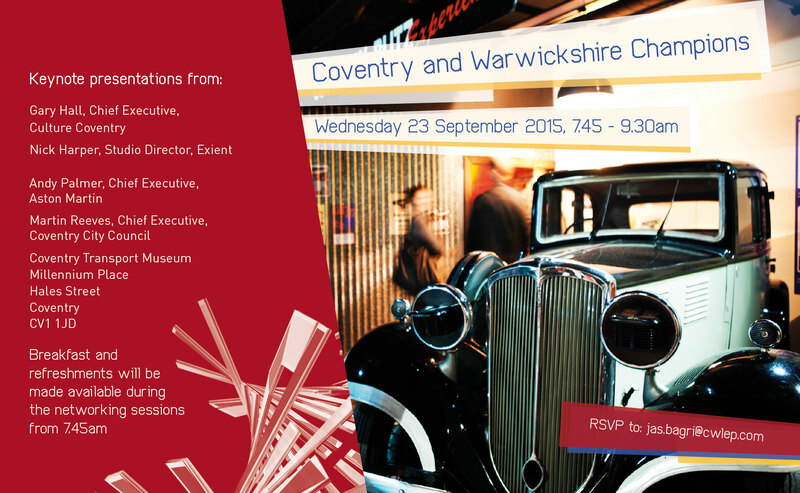 Coventry is known around the world as a City of Peace and Reconciliation – but what does that mean to the city, to the organisations that base themselves here and to you? 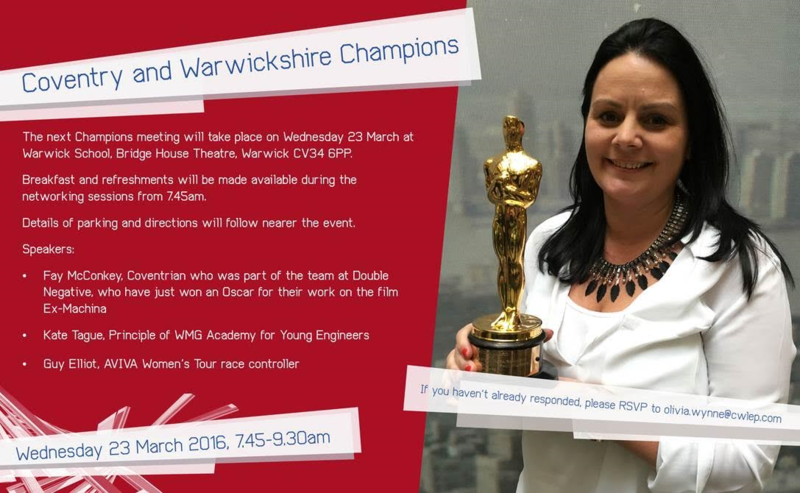 Covered presentations from Liv Garfield, CEO of Severn Trent; David Wright, Director of Strategic Initiatives at Coventry University; and Joanna Reid, Executive Director at The Belgrade. 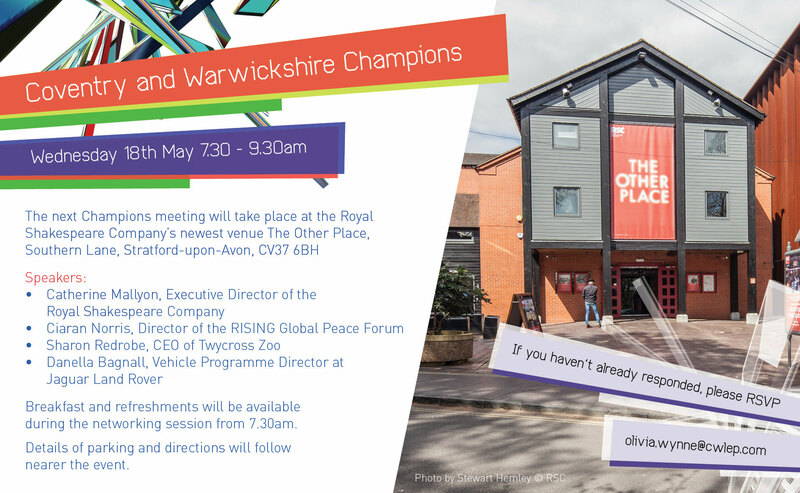 Covered presentations from Catherine Mallyon, Executive Director of the Royal Shakespeare Company, Ciaran Norris, Director of the RISING Global Peace Forum, Sharon Redrobe, CEO of Twycross Zoo, Danella Bagnall, Vehicle Programme Director at Jaguar Land Rover. 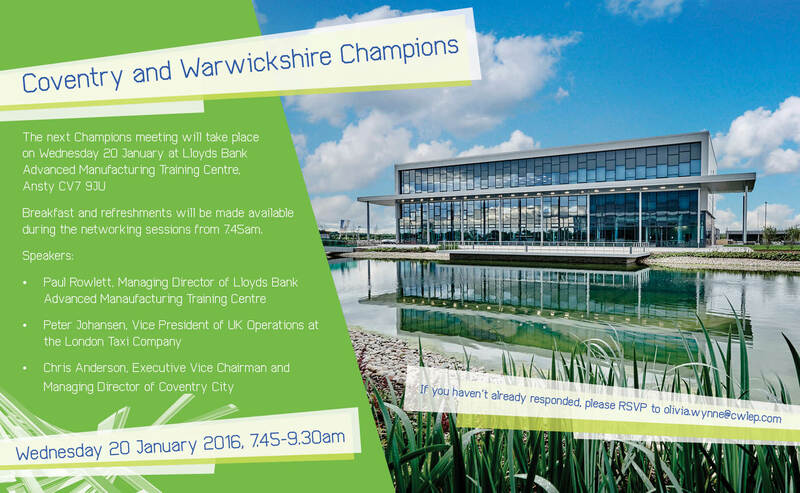 Covered presentation from Paul Rowlett, Managing Director of Lloyds Bank Advanced Manufacturing Training Centre, Peter Johansen, Vice President of UK Operations at the London Taxi Company, Chris Anderson, Executive Vice Chairman and Managing Director of Coventry City. 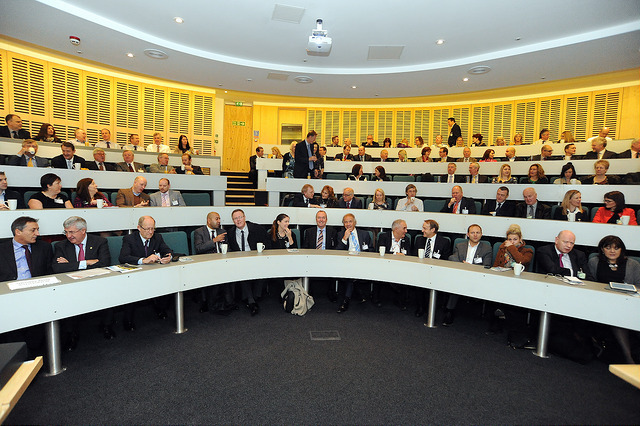 Covered presentations from Professor Jonothan Neelands, from Warwick Business School, Jonathan Browning, Chairman for the Coventry and Warwickshire Local Enterprise Partnership, Mark Parsons, Chief Executive of Coventry Building Society, and Bob Mackenzie, Chief Executive of The AA. 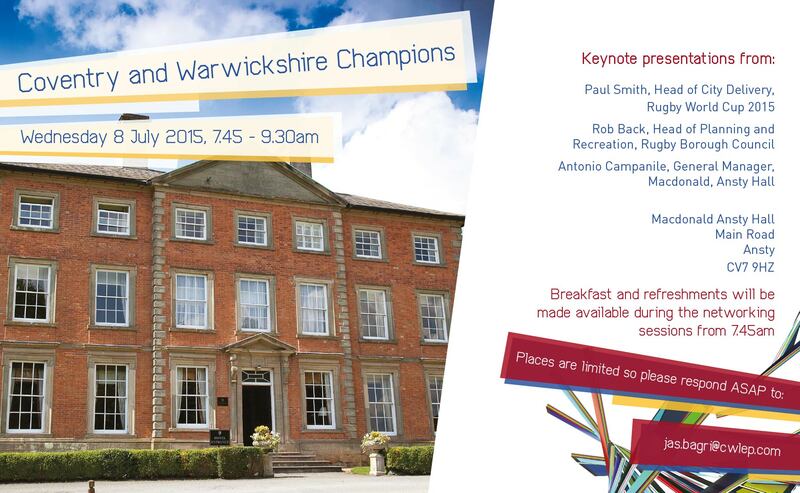 Covered presentations from Paul Smith, Head of City Delivery for Rugby World Cup 2015; Rob Back, Head of Planning and Recreation at Rugby Borough Council; and Antonio Campanile, General Manager of Macdonald, Ansty Hall. Covered presentations from Mike Wright, Executive Director at Jaguar Land Rover, David Bliss, Trustee at The Heart of England Forest, Helena Pettit, Managing Director of Grandstands Group Ltd and Colin Hooper, Estates Director at Stoneleigh Park. 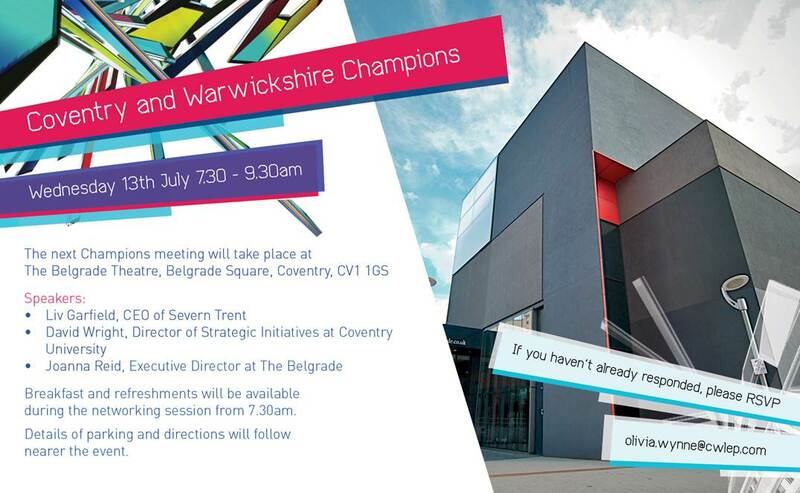 Covered presentations from Justine Theman, Associate Director, Belgrade Theatre, John Latham, Vice-Chancellor, Coventry University, Roger Harrabin, BBC Environmental Analyst and Andy Hardy, CEO at University Hospital Coventry and Warwickshire.